You had to duck to miss the food issues flying through the global cafeteria last week. For the first time since widespread famines devastated whole populations, serious doubts about global food supply have gripped societies throughout the world. The problem this time is not so much the quantity of food produced (if it ever was), but what productive land will be used for, who will feed us, and who will eat. In Argentina, soybean producers blocked roads to protest a tax hike on exports levied by the government of President Cristina Fernandez. Soybean producers have reaped a financial bonanza over the past years, harvesting high prices with the full support of the government and driving basic food producers off the land. As politicians and exporters hurled insults back and forth, urban consumers experienced food shortages due to interruption of food transport between the cities and the countryside. 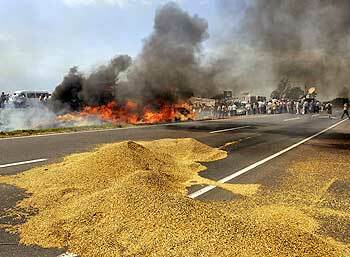 In Bolivia, cooking oil producers demonstrated against the government's temporary prohibition on exports. The Bolivian government of President Evo Morales has frozen exports until domestic demand can be met at affordable prices. Producers in the province of Santa Cruz used the occasion to reiterate demands for regional autonomy and intensify opposition to government social welfare policies. In Mexico, the biotech lobby moved one step closer to legalizing genetically modified (G.M.) corn in the country with new rules on a bio-safety law made-to-order to their interests. Farmers' organizations warned that the measure threatens native corn varieties, livelihoods, and the nation's food sovereignty. G.M. corn cross-pollinates naturally with native varieties, creating genetic contamination of varieties that indigenous farmers have developed over centuries. Their use also makes farmers dependent on transnational seed companies, instead of relying on millennia-old practices of seed-saving. Each of these conflicts is inserted in its own complex national political scenario. But they share something in common: they are part of a battle over the future of food and agriculture. As prices for basic commodities soar, small farmers, instead of reaping the benefits, find themselves facing a new set of threats to their livelihoods. A recent report by the United Nations Economic and Social Commission for Asia and the Pacific (ESCAP) cautions that global food prices will stay high. The report blames in part the biofuels boom for rising food costs. "With grains and oil seeds the key feedstocks for bio-fuels, the oil price rise exerted a strong push on agriculture commodity prices in 2007, which enjoyed their best performance for almost 30 years. As oil hit $100 per barrel in January 2008, soybean prices jumped to a 34-year high, corn prices approached their recent 11-year high, wheat prices were just below their recent all-time high, rapeseed prices rose to record highs and palm oil futures hit a historic high." The report concludes, "Governments need to carefully consider the impact of bio-fuels on the poor." Other factors that have joined to create the crisis in the food supply include climate change, concentration in production and marketing, spreading urbanization, erosion and pollution of natural resources, higher demand for livestock, and government policies that have made smallholder farming—still the source of most of the world's food supply—a "non-competitive" (and therefore non-viable) economic activity. All this raises the problem of who has access to food. With rising international market prices, de facto access to basic foodstuffs for the poor is in jeopardy. The United Nations predicts global food prices to go up between 20 and 50 percent by 2016. Price hikes in basic foods hit the urban poor the hardest, since their access to food is precarious and they are forced to spend a higher percentage of their total income on feeding their families. When that happens, governments need to rethink their dependence on the international market for food and revisit policies that foment the use of land to produce cash crops for export. Bolivia isn't the only country that has resorted to export bans. Facing a serious rice shortage and high prices, Cambodia, India, and Egypt have effectively banned exports, and Vietnam placed limits on exports. The Philippines, unable to meet its own demand, has had to urge cutbacks on consumption. It's also way past time that institutions of global governance take a hard look at the human cost of allowing a handful of transnational companies to control so much of our global food supply. Mexico's tortilla crisis turned out to be more a problem of speculative control of supply than a real supply-and-demand problem. The economic power of agribusiness has grown so much in recent years that government or civil society attempts to assure food supply meet with potentially destabilizing resistance. Unless these governments hold fast to their right to regulate supply, these food fights could develop into all-out war. From the Americas Program of the Center for International Policy (C.I.P.). Laura Carlsen is director of the Americas Policy Program in Mexico City.